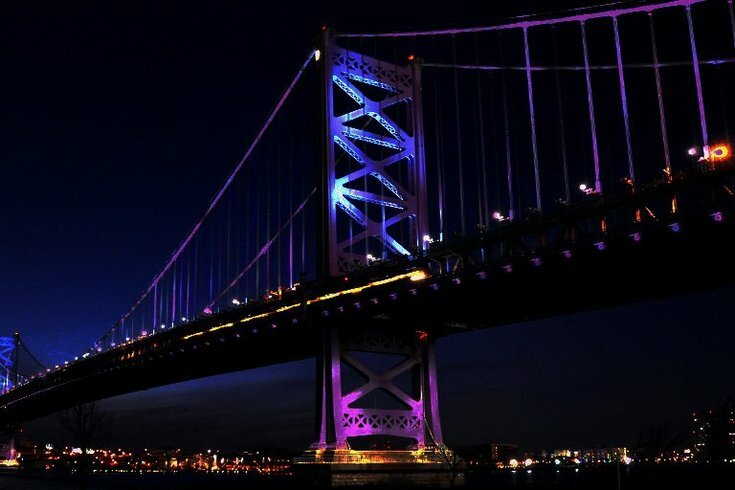 The Ben Franklin Bridge will be dressed up in a variety of colors on May evenings, highlighting awareness for causes from lupus to the observation of Memorial Day. Picking up where the recent bridge memorial for the passing of the popstar Prince left off, May 1 through May 7 will be purple for Lupus Awareness Month. May 8 the bridge connecting Philadelphia to Camden will have a magenta glow for Mother’s Day and the maternal bond. On May 9 the bridge will be bathed in cyan for Women’s Lung Health Week, then it is back to purple again for lupus from May 10 to May 14. May 17 to 22 will be red for Hepatitis Awareness Month. Finally, May 26 through May 3 the Ben will be red, white and blue to observe Memorial Day weekend and also to honor the sacrifices made by service members.